It has been requested that this article be rewritten and expanded to Include more information on multiplayer minigames because it requires general cleanup. WarioWare, Inc. Mega Party Game$!, known as Atsumare!! Made in Wario (あつまれ! !メイド イン ワリオ Atsumare!! Meido in Wario, lit. "Gather!! Made in Wario") in Japan, is a game for the Nintendo GameCube and the second installment of the WarioWare series. 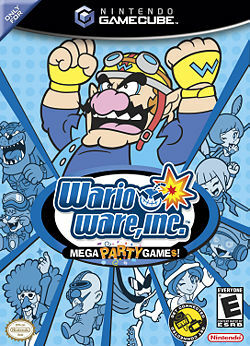 It reuses all the microgames from the original game WarioWare, Inc.: Mega Microgame$!, but Mega Party Game$! focuses on multiplayer in particular. It comes with eight special multiplayer modes for up to four players that all involve the known microgames in some way. While it includes a few new modes, the single player mode is heavily reduced and doesn't feature the unlockable mini-games from the predecessor. Mega Party Game$ and the later release, WarioWare: Snapped! are the only WarioWare games without plots and story-themed stages. Stage Clear - Clear the selections of microgame genres. Each genre is given to a different WarioWare character (see Microgame genres above). After a while, microgames will be played at higher speed and difficulty. The player has four hearts. When the player loses a microgame, they will lose a heart. When all hearts are gone, the game will end. When the player beaten the last microgame, the Boss Stage, the stage is cleared and a extra heart will be awarded. When one stage is cleared, the next stage will be played until all stages are cleared. All Mixed Up - All the microgames of the different stages are all mixed together. Speed and difficulty will get higher when the player makes progress. The player has 4 hearts and it's possible to earn new hearts. When the player has won 30 games, Time Attack is unlocked in Games. Hard - All the microgames are at a high speed but at the lowest difficulty. The player has 4 hearts and can't earn new hearts. Thrilling - All the microgames are at a low speed but at the highest difficulty. The player has 1 heart and can't earn new hearts. Time Attack - Play through 20, 40 or 60 games. When winning a game, speed will get higher. When losing a game, speed will get lower. The player must try to get the smallest time at the end of the microgame row. Master Mode - Play all the microgames in the game. Character Intros - Information about the WarioWare characters can be found here. Movie Matters - View movies. These videos contain two music videos and all the other are stories. Staff Roll - View the game credits. The player can shoot on question marks to transform them into letters. In album mode, the player can play single microgames. They first need to select a genre of microgames before they can play a microgame. When selected a microgame, the player can select if it will be played in Record or Practice mode. In Practice mode, the player can set up the speed of the microgames to practice them. In Record mode, the player tries to win the microgame as much as possible. When the player won enough microgames, they will be awarded with a flower. When all flowers of the microgames are won, Master Mode is unlocked in Games. Jimmy's Survival Fever - Survival Fever is a microgame versus mode where players play microgames, if the player fails a microgame, they lose part of their audience. If the whole audience is gone, the player loses. Wario's Outta My Way - In Outta My Way; one player is playing microgames while the other players grow giant and try to distract them to make them fail. The player with the most microgames completed wins. 9-Volt's Card-e Cards - Players have to pick up e-Reader cards with a screenshot of a microgame on from one of two decks, with these cards going on a pile on the left of the screen. At random, a card containing a Game Boy Advance with an e-Reader will be drawn. At this point, the drawer has to play the microgames on the microgame cards in the pile. If the player wins all the microgames, they win all the cards on the pile. If the player loses one microgame, they lose all the cards in the pile and all the cards they have previously won. All those cards will go to a pile on the right of the screen. If a player has cards, background players could steal cards by pressing repeatedly during a microgame. After all cards have been drawn, the player with the most amount of cards wins. Dr. Crygor's Balloon Bang - In Balloon Bang, one player plays microgames while other players repeatedly press to blow up a balloon. Players rotate by the player at the microgame winning. The game ends when the balloon pops and the person playing the microgame loses. Kat & Ana's Wobbly Bobbly - Wobbly Bobbly is a versus mode where players balance on tortoise shells. The players play a multiplayer minigame and the winner plays a microgame. Depending on whether or not they win or lose a shell is added to the player or their friend(s). The game ends when all but one player fall. Dribble & Spitz's Milky Way Delirium - The players have a square of asteroids with numbers on them. The number corresponds to the number of microgames that must be played in order to claim the asteroid. Complete the required number of microgames, and the asteroid is marked as belonging to the player that completed the games. If a player claims an asteroid that is in a vertical, horizontal, or diagonal line ending with another one of the player's asteroids, every asteroid in that line falls under possession of the player as well. When all of the asteroids have been claimed, the player with the most asteroids has to fight a big robot, if the player beats the robot, they will win the game. If not, the others win. Mona's Listen to the Doctor! - In Listen To The Doctor!, players are in a doctor's office. One player goes in and does a microgame as well as to do something outside the game like confess something embarrassing. If the player completes both tasks the other players clap by repeatedly pressing . The player with the most claps wins. Orbulon's All For One - This is the only multiplayer game where the other players help another player instead of battling to each other. The player's character shows a Game Boy Advance, and it's his goal to get a high as possible record. However, the screen's light fell out, so the other players have to help the player who plays microgames, by controlling a spotlight. There are three chances. If all three batteries are gone, the game is over. Jump Forever - A jumping rope game. 2 to 4 players must jump over the jump rope at the same time. If one or more players touch the jump rope, the game is over. Paper Plane - A paper airplane race. Who will reach the finish first? If a player crashes against a wall, they will respawn, but lose time. 1 Controller Survival - Up to 16 players can play microgames with only one GameCube Controller. If a player fails a microgame, they are out. Last one remaining is the winner. 1 Controller Jump Forever - Same as Jump Forever, but up to 16 players can play with only one GameCube Controller. If one of the 16 players hit the rope, the game ends. Main article: List of microgames in WarioWare, Inc.: Mega Microgame$! The game received generally favorable reviews from critics. IGN gave the game a 7.5 out 10 stating it as a "fun multiplayer game that suffers from a bad case of deja joue". GameFAQs gave the game a 7.5 out of 10. Metacritic gave the game a 76 out of 100 based on 46 reviews. Eurogamer's Kristan Reed gave the game a 7 out of 10 saying that "You've got to fight! For your right! To paaaaaaaaaaarty!" IGN 7.5/10 The recycling of mini-games takes its toll on the multiplayer modes as well. With only a handful new challenges, the element of surprise is severely lessened for returning players. Buy it only if you play a lot of multiplayer games at your house. Or rent it for your next party and spend the rest of your cash on a giant keg. Gamespy 4/5 I highly recommend GameCube owners check out WarioWare. Providing you've got a few friends who share similar gaming sensibilities, WarioWare, Inc.: Mega Party Game$ will make an excellent addition to your library. Even if you don't go for multiplayer gaming that much, I think you'd be hard pushed not to fall in love with the anarchical madness on offer here. Just don't expect a revelation where the single-player game is concerned -- the GBA has that aspect nailed better than any other attempt ever could. Eurogamer 7/10 If the answer to all our problems is to simply party your way through them, then consider Wario Ware Inc as your gaming ally. It's not perfect, and we hope Nintendo takes the concept further, but it's still well worth checking out even for a few hours' worth of hilarity. The game was a coproduction between Nintendo R&D 1 and Intelligent Systems, a collaboration that would continue for most subsequent WarioWare games. A large portion of Mega Party Game$! 's staff had previously worked on WarioWare, Inc.: Mega Microgame$!. Programmer Goro Abe was promoted to Director position, a role which he would continue to assume for most WarioWare sequels. The game was one of Nintendo R&D 1's last releases before its dissolution. For this subject's image gallery, see Gallery:WarioWare, Inc.: Mega Party Game$!. This page was last edited on April 5, 2019, at 21:45.